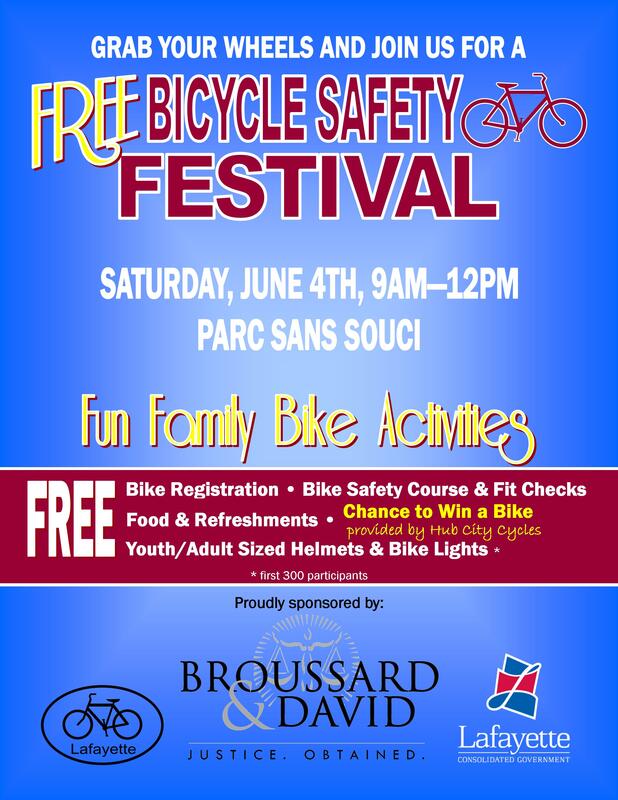 The first annual Bicycle Safety Festival will be held on June 4th from 9am-12pm at Parc Sans Souci in downtown Lafayette. 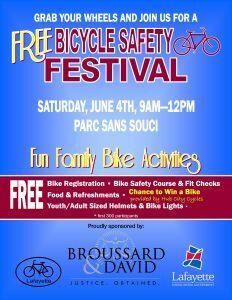 The Bicycle Safety Festival is presented by Lafayette Consolidated Government, Bike Lafayette, and Broussard & David, LLC. There will be free adult and youth bicycle helmets for the first 300 participants, free bike registration, free safety training and instruction, and participants are eligible to win a free bicycle (valued at $300 – courtesy of Hub City Cycles). Additionally, there will be food, refreshments and musical entertainment by Zydeco Radio. In Acadiana, there have been far too many cyclists injured in preventable bicycle accidents. The aim of this event is to help cyclists and motorists become more knowledgeable about bicycle safety and the rules of the road. As Lafayette Consolidated Government embraces more bicycle lanes and smarter growth, bicycle awareness is becoming even more essential. Broussard & David, LLC, a law firm located in downtown Lafayette, has a great deal of experience in representing people catastrophically injured in bicycle related accidents. In sponsoring this event, the partners at Broussard & David, LLC hope that — through education and training — the roads will be safer for bicyclists, motorists and pedestrians alike.